The countdown to CUSU Welcome Festival﻿ is on! 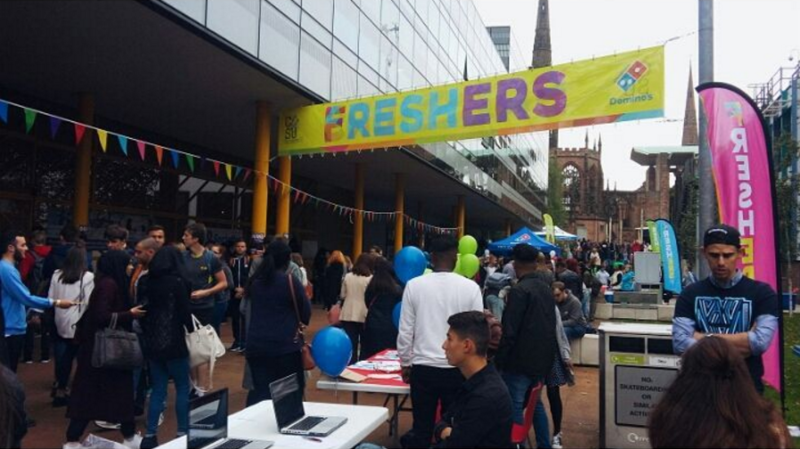 Formally know as Freshers, Welcome Festivals is two weeks of incredible events to start you off at Coventry University with a bang! From the Official Opening﻿ ﻿to the Big Closing party and everything in between, these events are the perfect ice-breakers and can really help you get to know fellow students and flatmates. Sat 22nd Sept - The Official 2018 Opening Party is held at Square One and The Empire from 9pm 'til 3am. Meet fellow Fresher students, enjoy multiple rooms of music and an outdoor area and expect guest DJs, stilt walkers, fire performers, and giveaways! Mon 24th Sept - Welcome Fair takes over The Hub from 11am - 4:30pm. This is the perfect opportunity to learn about all the communities you can get involved in during your studies. Tues 25th Sept - Freebie Fair﻿ takes over The Hub from 11am - 4:30pm. We're recognised as being in the top 20 Freshers Fairs, so why not head down and take advantage of deals, discounts and offers from loads of companies? Tues 26th Sept - Freshers Ball is when you need to dress to impress! This prestigious event features special guest DJs, dancers and glitter galore! It's at the Cathedral Ruins from 7pm 'til 12am. Be part of this 2-week welcome celebration and get your Welcome Festival 2018: All In Pass now for only £70! We can't guarantee that passes will be available to buy when you arrive, so we advise reserving yours online so you don't miss out.